The Mouria is a 12 room, 1 star hotel in Skiathos Town. Rooms are air conditioned and include a television, fridge and terrace. 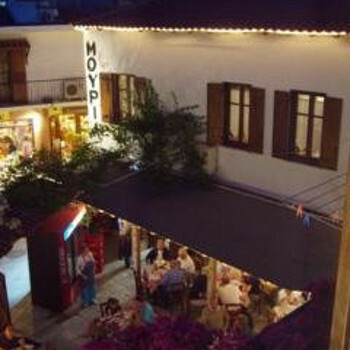 The Mouria is a family-owned taverna located on the main street in Skiathos Town. The rooms are clean and well maintained. They are well equipped with air con, TV, fridge and en-suite facilities. As this is a town centre taverna, there is no swimming pool or garden area. But, if you just need a hotel room to use as a base, the Mouria is ideal. Areti (the proprietor) and her staff are friendly and approachable. Breakfast is provided in the taverna, and consists of fruit juice, fresh bread with jam, croissants, cake and coffee. Evening meals are optional. The taverna specialises in fresh grilled fish, and was busy most evenings. During our week's stay, we only dined there once, as we wanted to try out some of the other restaurants.